1968 Triumph TR250. Body and paint restoration by Britsport in Spring 2009. One owner car for the last 35 years. Extremely rare factory American mags. 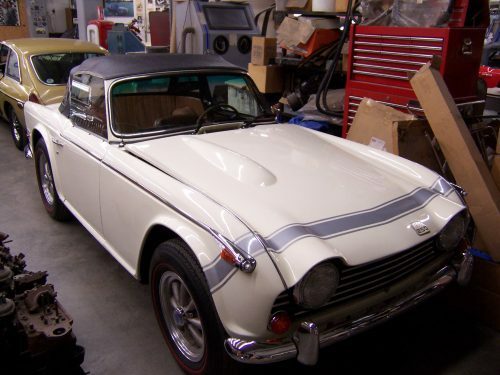 One of the nicest, tightest, well maintained Triumph’s I have ever driven. The mapping/taping/painting of the bonnet stripe took the most of two days to accomplish. This entry was posted on Thursday, June 3rd, 2010 at 6:56 pm	and is filed under Britsport, Past Projects. You can follow any responses to this entry through the RSS 2.0 feed. Both comments and pings are currently closed. hi,may i have more pics and the price,kind regards,thierry.